SECOND SLICE: HOW TO TAKE YOUR WATERMELON TO THE NEXT LEVEL - What About Watermelon? Way back in 2011, I shared a secret that changed people’s lives forever. Well, it changed mine, anyway, which is why I’m posting it again today. CAUTION: The ingredients may cause temporary euphoria of the taste buds. If the effects last more than four hours, thank me later, and consider yourself lucky! I’ve eaten approximately 47,000 watermelons in my 37 years, which makes me sort of an expert on eating watermelon. Don’t bother doing the math; just trust me that it’s true. Having eaten so many watermelons, I’ll be the first to admit that occasionally you get one that seems to be missing a little something. And by “something,” I mean flavor. There, I said it. It’s nobody’s fault; it just happens. If it happens to you, the important thing to remember is not to panic. You can always take the watermelon back to the store and, in most cases, they’ll be happy to exchange it for another watermelon. If you don’t feel like taking it back to the store, (And why should you? Most “missing something” watermelons still make great snacks. 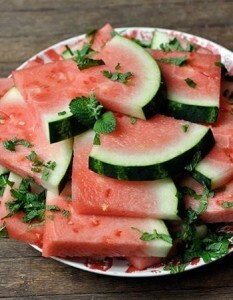 ), the trick below, courtesy of TheKitchn.com, can be used to bring any watermelon back to life. NOTE: Although this trick can turn a below-average watermelon into a good watermelon, it can also be used to turn a good watermelon into an amazing watermelon. That’s assuming, of course, that your taste buds can handle so much awesomeness. I took a tip from the practice of salting watermelon, which concentrates the juice and makes the sweetness more pronounced. Sugar has a similar effect, so I put out a couple tablespoons of sugar, along with the zest of a lemon and a couple handfuls of fresh mint leaves. I cut up about half of a small watermelon in thick slices, and layered the watermelon slices on a plate. As I layered the wedges, I very lightly sprinkled the slices with sugar. Then I rubbed some zest over the layer and sprinkled with chiffonaded mint. I did this to each layer of the watermelon slices, finishing off the dish with a full sprig of mint. There you have it, folks. A little sugar, a little lemon and a little mint. This trick works because watermelon has an incredible ability to absorb different flavors. That’s also why we often see watermelon used to complement other dishes. Before you dive into this trick, you might want to try just one of the ingredients (mint, sugar or lemon) to see if one is all it takes. If it works, let me know with a comment. I’ll try it, too, and let you know the results. REMEMBER: All comments left on the blog this month are entered to win our September prize — the watermelon pop-out cutter — so comment as often as you’d like!